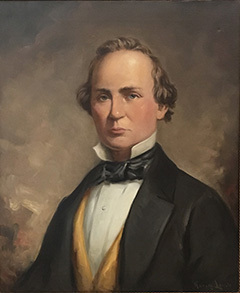 Former Justice Bird Pearson was the 11th Justice of the Court and served from 1856 - 1859. He grew up and studied law in South Carolina. He practiced law and served as a state solicitor in his home state until 1838. He later established a plantation in Alabama, and then another near Brooksville, Florida, in 1845. Pearson moved again, to Jacksonville, in 1851. He prospered there, and became active in Democratic Party politics. Pearson considered entering the race for Supreme Court Justice in the first popular election for the court in 1853. He declined the opportunity that year, but, in 1855, when Justice Thomas Douglas died, Pearson reconsidered, campaigned, and won the right to fill the remaining four years of Douglas’s term. Justice Pearson was plagued by ill health throughout his tenure on the court. He declined to seek reelection in 1859 and retired back to Jacksonville, where he died that fall.